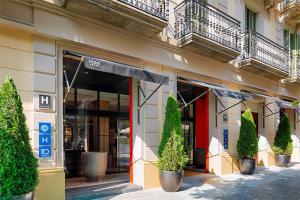 The H10 Metropolitan is housed in a historic building that has been carefully renovated and decorated by the prestigious interior designer Lázaro Rosa-Violán, in a style inspired by industrial Barcelona of the 19th century. The hotel has modern rooms, a restaurant for breakfast, a cafeteria that leads onto a pleasant terrace with a swimming pool and, on the top floor, a terrace with plunge pool and sun loungers. Located 7 miles from the Barcelona Airport. Sagrada Família, Sagrada Família, Güell Park, Casa Milà, Parc de la Ciutadella, Arc de Triomf.